For centuries carved writings and artworks in churches lay largely unnoticed. So archaeologist Matthew Champion started a nationwide survey to gather the best examples. His book has just been published. 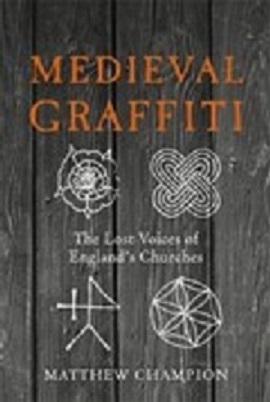 A fascinating journey through the jottings and idle carvings of medieval England, Medieval Graffitti: The Lost Voices of English Churches shows us strange medieval beasts, knights battling unseen dragons, ships sailing across lime-washed oceans and demons who stalk the walls. Latin prayers for the dead jostle with medieval curses, builders’ accounts and slanderous comments concerning a long-dead archdeacon. Strange and complex geometric designs, created to ward off the ‘evil eye’ and thwart the works of the devil, share church pillars with the heraldic shields of England’s medieval nobility.